Relax after a long day with this stylish chair. The beautifully rolled arms with nail head trim offer a sophisticated and traditional feel, while the sleek, tapered wood legs support the solid wood frame. The basic boxed seat and T-back cushions are filled with the highest quality Qualux ® Ultra foam, to ensure absolute comfort that’s made to last for years. For a completely inviting living room, add the matching ottoman. The 395 Style Group Stationary Chair with Rolled Arms and Nail Head Trim by Smith Brothers at Saugerties Furniture Mart in the Poughkeepsie, Kingston, and Albany, New York area. Product availability may vary. Contact us for the most current availability on this product. Welcome to a comfortable and traditional living room with the 395 Style Group. 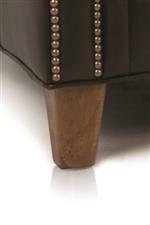 These pieces include beautiful rolled arms with nail head trim and tapered wood legs, creating a warm and stylish feel. Not only are these pieces fashionable, but they are also cozy and made to last, as the cushions are filled with the highest quality Qualux ® Ultra foam. 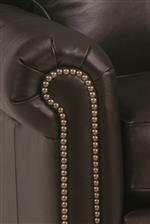 And since this collection is available in fabric or leather, you can customize it to match with your décor. This collection is made in America, so you can be sure you'll be sitting on carefully constructed pieces. Whether you're looking for one accent piece or you're designing your entire family room, the 395 Style Group is sure to please. The 395 Style Group collection is a great option if you are looking for Traditional furniture in the Poughkeepsie, Kingston, and Albany, New York area. Browse other items in the 395 Style Group collection from Saugerties Furniture Mart in the Poughkeepsie, Kingston, and Albany, New York area.